HONOLULU — On June 7, Hawaii Gov. 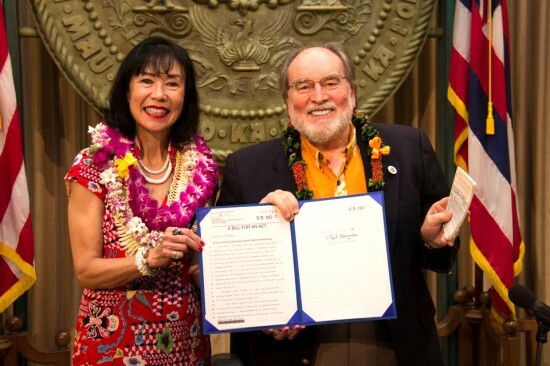 Neil Abercrombie signed into law a bill establishing Jan. 30, Fred Korematsu’s birthday, as “Civil Liberties and the Constitution Day” to celebrate, honor, and educate the public about various individuals’ commitment to preserving civil liberties. The Aloha State joins California as the two states that permanently recognize a day for the late civil rights leader. “I wish my father could see this. He was a very kind and humble person. When he accepted any recognition he always did it on behalf of all Japanese Americans,” said Karen Korematsu, daughter of Fred Korematsu and executive director of the Fred Korematsu Institute in San Francisco. While not a state holiday, the observance is intended to celebrate, honor and educate the public about these individuals’ commitment to preserving civil liberties. “The governor is planning to proclaim it Fred Korematsu Day next year, because they can only make a resolution for one day a year,” Korematsu explained, adding that plans are already under way for next year’s celebration. Among those in attendance were members of the Honolulu Chapter of the Japanese American Citizens League; Carole Hayashino, executive director of the Japanese Cultural Center of Hawaii; and Mary Chun, a social studies teacher at Waialua High and Intermediate School. Chun attended a Korematsu workshop and was inspired to share with her students the need for a Korematsu Day in Hawaii. Forty students wrote letters of support to the governor. Senate Bill 856, enacted as Act 94, was passed by the 2013 Legislature without dissenting votes and was supported by the American Civil Liberties Union, Hawaii Council for the Humanities, JACL, Japanese Chamber of Commerce, Fred T. Korematsu Institute for Civil Rights and Education, State Civil Rights Commission, and University of Hawaii. The bill references actions of the U.S. government, including the internment of Americans of Japanese ancestry during World War II. After the bombing of Pearl Harbor, President Franklin D. Roosevelt issued Executive Order 9066 on Feb. 19, 1942, authorizing the removal of any or all individuals from military areas as deemed necessary and desirable, and mandating the forced internment of Americans of Japanese ancestry. Korematsu said the institute will push for federal recognition of Korematsu Day. “The strategy coming out of Hawaii is to launch a campaign for a federal Fred Korematsu Day. We needed another state besides California and now we’ll go to the other states as well,” Korematsu said. • Fred Korematsu was living on the West Coast during World War II when he was arrested and convicted of defying government orders to report to an internment camp. He appealed and lost his case at the U.S. Supreme Court, which ruled his incarceration was warranted. Forty-one years later, on Nov. 10, 1983, U.S. District Court Judge Marilyn Hall Patel vacated Korematsu’s conviction, an action considered pivotal in civil rights history. • Gordon Hirabayashi, born in 1918 in Washington state to Japanese parents who had immigrated to the U.S., was charged by a federal grand jury in Seattle with violation of Public Law 77-503. He appealed his case to the U.S. Supreme Court in the first challenge to Executive Order 9066 but lost his appeal when the court unanimously voted to uphold Hirabayashi’s conviction for violating the order. Forty-four years later, in September 1987, his conviction was vacated. • Min Yasui was born in 1916 in Oregon to Japanese parents and was commissioned as a second lieutenant in the Army Infantry Reserve. Although receiving orders to report to Fort Vancouver in Portland, Yasui was told that he was unacceptable for service and was immediately ordered off the base. Yasui was turned away eight more times after offering to fulfill his service to his country. On March 28, 1942, Yasui directly challenged the constitutionality of Executive Order 9066 and was arrested. Although his case was appealed to the U.S. Supreme Court, the court upheld the conviction of Yasui for violating Executive Order 9066. Forty-two years later, in 1984, the courts vacated his conviction.